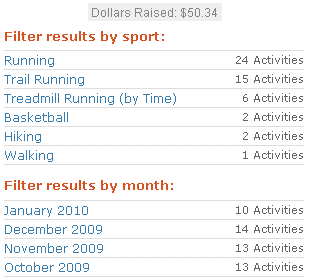 Yesterday I was looking at my Plus3Network donations and saw that I could hit $50 if I did a 10 mile run. I had planned on only doing 7.5 miles but this motivated me to do the little bit extra. So, not only was I motivated to push myself a bit more but, on my behalf, a firm rewarded a non-profit organization with a donation based upon my effort. I only had to spend a minute or two to log the run. If you haven’t checked out this site yet you should. You can get credit for most activities as you can see from the list below. As I was getting ready to head out for my run I checked the thermometer. A balmy 50 degrees. Not real warm for me, so, I dawned my thin beanie to keep my ears warm and pulled on the arm sleeves that I had initially picked up for biking. I still haven’t picked up any thin gloves and was quite aware of this when I headed out. Just before hitting the roadI heard the distinctive pitter-patter of rain drops. Fortunately, it appeared to be a stray rain cloud and passed by the time I headed out. A couple of bottles of water fastened to my Amphipod, my iPod playlist dialed in, my Garmin Edge 405 locked on some satellites and I pushed the [Start] button and headed out. My 10 mile run is basically an out-and-back run that is mainly on roads. I start by picking up the Bay Area Ridge Trail for about .25 mile to the main road into our development. Three-quarters of a mile later and I’m heading out to the Rowell Ranch Rodeo grounds on the primary artery through Castro Valley. When I hit the main gate I’ll be exactly five miles out and ready to turn back and head home. There was quite a stiff breeze pushing into me on the outbound leg. Every one-in-awhile there would be something blocking it just long enough to see the water vapor from my exhales. When I was about half a mile from the rodeo grounds the sky opened up. Not a downpour but heavy, large raindrops. I pushed the iPod to my back to keep the rain off of it, ducked my head and pushed on. A short time after turning around and heading back the rain let up, or I caught back up with the edge of the rain cloud. All-in-all I didn’t get too wet and my electronics fared well. I’m thinking I should start keeping a log of road kills. Is that disturbing? Today’s tally was one poor little robin that was truly flat. I really should have taken a pause to get a photo as it was interesting how I could easily make out what it was even though it was flatter than a pancake. The other road kill was a skunk. Okay, the skunk had been picked up off the parkway but the stink remained. I had seen the unfortunate soul earlier in the day when I took Harrison to school, so, I knew it wasn’t an errant release of perfume. On other runs I’ve seen pretty much the range of critters in the area from cats to raccoons to dogs. I’ve seen opossum while driving but don’t think I’ve seen any while running. Outside of skunks, the smelliest thing, which I didn’t initially see but certainly smelt, was a deer; quite nasty. I think the most interesting, unfortunate victim was what appeared to be a dog. What was interesting was that it hadn’t been picked up and, as such, had fully decomposed down to the bones. The skeleton was laid out rather perfectly. 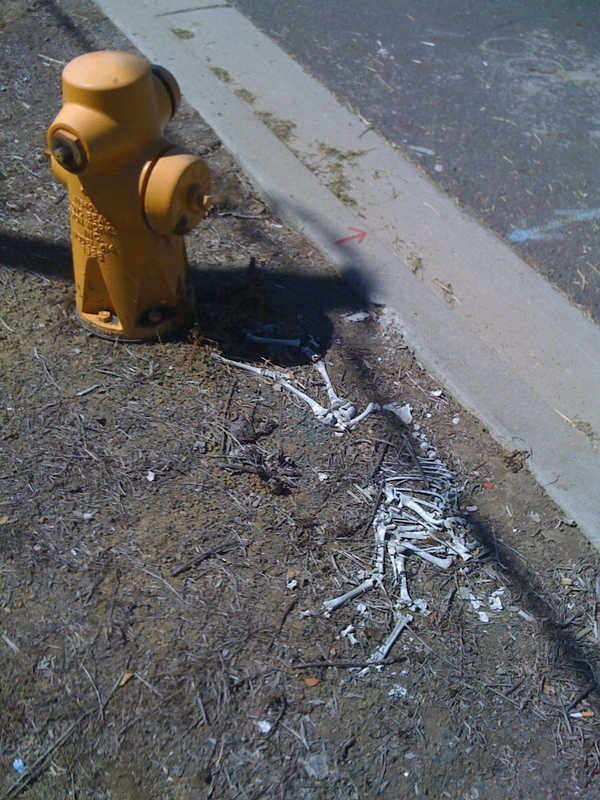 I know puppy death isn’t funny but the fact that this dog’s skeleton was juxtaposed next to a fire hydrant made it quite difficult not to laugh. 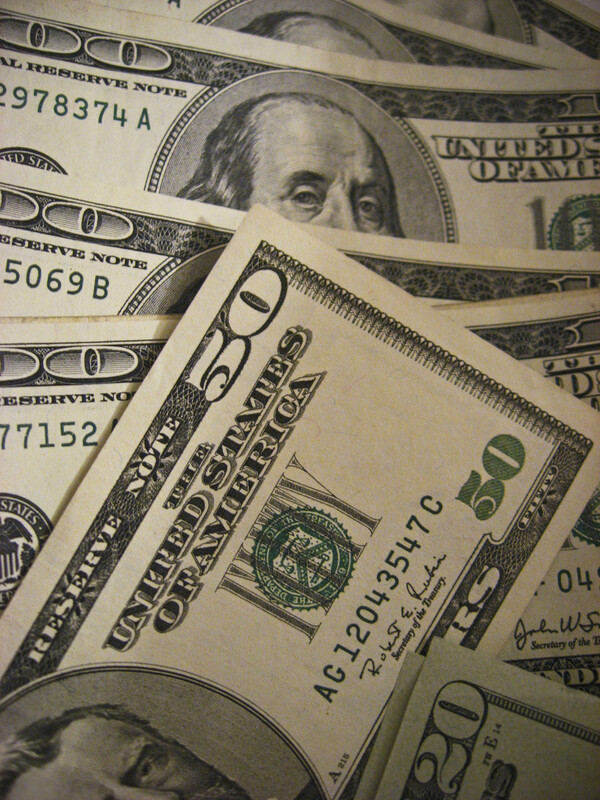 The other thing I took on today was signing on for a 2010, 1,000 mile challenge on BuckeyeOutdoors.com. If I am good about getting in my 20 miles of running per week I can pull this off. As of right now I’m about 20th out of 134 folks who have signed up. 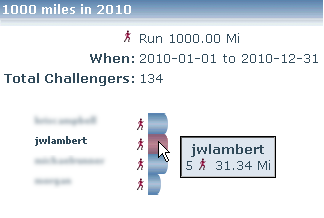 You can get a quick look at my weekly mileage and notes over in the sidebar of this site. So, other than my body being a bit tired from the running my knees are good and my hip doesn’t seem to get sore much anymore. The worse thing is that my lower back has started bothering me again and doesn’t seem to be letting up. I’ve actually got my desk in the standing position as I write this hoping that this might help. So far it isn’t and I’ll likely shift to sitting pretty soon… after I grab some Advil.